Can India Keep Pace With China in Africa? Senegal's President Macky Sall greets German Chancellor Angela Merkel . Chancellor Merkel has arrived in Senegal ahead of visits to Ghana and Nigeria. With nearly a dozen CEOs in tow, the German chancellor hopes that economic development will curb migration from the region. German Chancellor Angela Merkel landed in Senegal late on Wednesday as she starts off a three-country west African tour. The chancellor is set to press for further investment in a region that produces many of the migrants trying to make their way towards Europe. 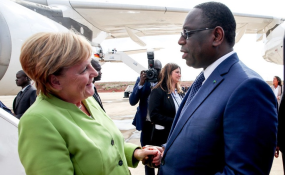 Indeed, migration was the main focus of Merkel's first day, during which she met Senegalese President Macky Sall. "We must not be accomplices of the people smugglers. We must fight illegality but also create legality and conditions for work here on the ground," Merkel said via her spokesman Steffen Seibert. Sall agreed with Merkel, saying that attempting the often deadly Mediterranean crossing was "not in the dignity of Africa," and remind his citizens that they were likely to be rejected for asylum in Europe, as there was no war or religious persecution to flee at home. After the meeting, Germany announced that it would help bring electricity to 300 villages in Senegal. Merkel is also set to visit Ghana and Nigeria, with about a dozen German CEOs in tow. With Ghana and Senegal representing two of Africa's fastest growing and most stable economies, and Nigeria's position as the region's powerhouse, many are hoping that promoting further development in these nations will stem the number of migrants heading north. The German chancellor also recently spoke with Prime Minister Abiy Ahmed of Ethiopia, one of the continent's top ten economies, and invited him to visit Berlin. Germany is also try to broker reconciliation between Ethiopia and neighboring Eritrea. Eritrea is known for its repressive one-party state and poor economy, and is one of the main countries from which migrants flee to attempt the sea crossing to Europe.